Women & Creativity is an annual, month-long series of events taking place in Albuquerque, NM during the month of March—Women’s History Month—that celebrates women’s creativity across multiple disciplines. WOMEN & CREATIVITY is an annual, month-long series that celebrates women’s creativity across disciplines. This year marks the 11th anniversary of the program. 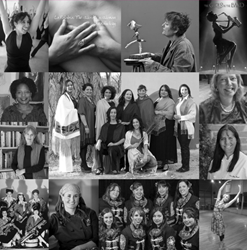 Women & Creativity is an annual, month-long series of events taking place in Albuquerque, N.M. in March—Women’s History Month—that celebrate women’s creativity across disciplines. This year marks the 11th anniversary of the program, which is coordinated by the Harwood Art Center and Artful Life with media partner Edible magazine. Eleven Featured Events (see list below): inventive, collaborative and inspired programs that integrate a range creative fields including art, poetry, dance, music, sculpture, and multi-disciplinary collaboration. Play Along Projects: Whether in Albuquerque or Abu Dhabi, Santa Fe or São Paulo, you can participate in our Tête-à-Tête or Poet’s Post Trading Cards projects. Community Calendar: dozens of other extraordinary exhibitions, performances, workshops and other presentations during the month of March—Women’s History Month—presented by program partners. All events are open to the public. Some are free; others have admission fees. For detailed information visit the Women and Creativity website: http://www.womenandcreativity.org. For MORE INFORMATION, INTERVIEWS, AND A FULL SCHEDULE OF EVENTS, visit the Women & Creativity website: http://www.womenandcreativity.org or email/call Valerie Martínez at valerie(at)artful-life(dot)org/505-603-0866.